Someone somewhere along the line started saying that the word ‘corduroy’ was derived from the French for ‘the king’s cords,’ corde du roi, but this turned out to be a false etymology. Which is a shame, because it sounds cute, and also because the introduction to this article probably would have been a lot more engaging if it had opened with a more substantial fact. There is certainly a regal quality to cords, however. Corduroy, which has its roots in a thick cotton fabric called fustian, originally woven in the Ancient Egyptian city of Fustat, is also referred to as the poor man’s velvet– it feels simultaneously economical and kingly. Cistercian monks, whose order was based on the living of a strict ascetic lifestyle, in evangelical poverty, rejecting even the slightest hint of opulence, deemed fustian to be cheap enough a material for their chasubles (sleeveless gown-like garments), but a few centuries later Shakespeare popularised the use of ‘fustian’ as an adjective to describe overly-extravagant writing or speech. Trying to decide whether to categorise the fabric as casual or luxurious proves difficult. Roland Mouret, Rag & Bone, Lacoste and Emilia Wickstead (who recently implied that Givenchy’s Clare Waight Keller copied one of her designs for Meghan Markle’s wedding dress, as if the very simple dress had any unique design features) all featured cord in their Autumn/Winter 2018 shows. 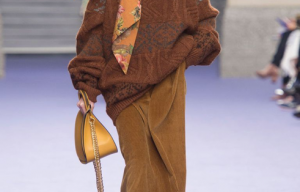 Corduroy was actually more prominent in the Autumn/Winter 2017 shows, with Prada and Marc Jacobs putting it at the core of their collections, but it is now, a year and a half later, that the high street is truly catching on. It is an interesting reminder that trends don’t materialise at the start of a season and then tidily disappear just before the next one begins, but rather can reach out over multiple seasons, and also that, perhaps unbeknownst to them, designers themselves are influenced by current trends and perpetuate them in the following seasons. The current appetite for cord very likely stems from how enamoured everyone was with velvet about five seasons ago. Corduroy is essentially ribbed velvet, and the ubiquity of velvet roughly two years ago gave us all a taste for soft, decadent textiles. 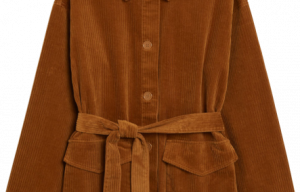 Corduroy has been regarded as somewhat awkward and fusty, which makes it all the more covetable. We want to feel like we’ve unearthed some trusty pieces from the seventies or something, treasured pieces that have played a role in many real-life stories and radiate romantic notions of lives lived. We want to look like we have impeccable taste and just picked out this functional cord jacket after sifting through a few old pieces. 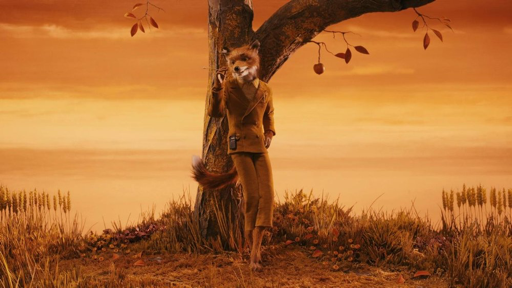 Basically, we all want to be as cool and offbeat as someone like, say, Wes Anderson, who is quite the corduroy connoisseur and has a true penchant for the fabric’s rusty charm, wearing a classic brown cord suit pretty much every day of his life, and deciding a classic brown cord suit would be a most suitable get-up for Mr. Fox, star of his 2009 animation Fantastic Mr. Fox. 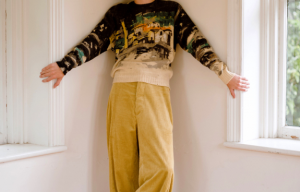 A film of which every shot is painted in the richest autumnal colours; honey, ochre, saffron, burnt sienna, chestnut, butterscotch– the pastel and primary colour corduroy pieces on the high street at the moment are fun, but if you really want to capitalise on the fabric’s quirky collegiate character (if you really want your look to strike a cord– I’m sorry) look to these warm, traditional tones.